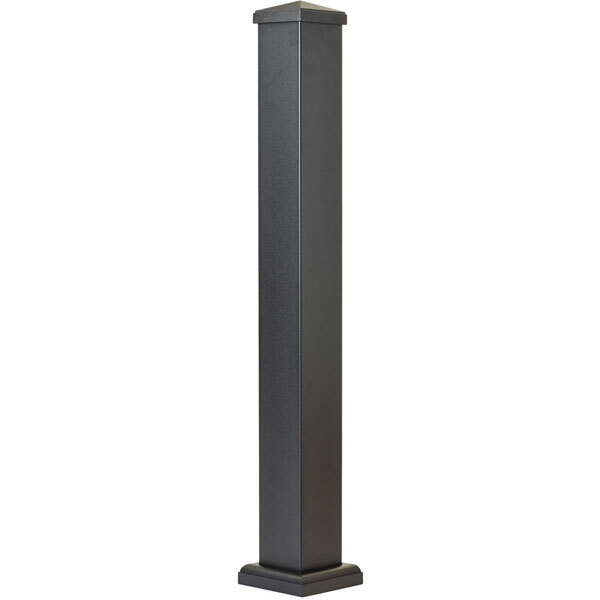 This Post Kit provides Post-to-Post style rail mount. It has a mounting flange that is welded to the bottom of the post which allows for surface mount of the post onto the deck, porch, patio, etc. The mounting flange is pre-drilled in the four corners for 3/8" fasteners. The Post Kit also includes one-piece base trim that will slide down the post once mounted to hide the fasteners. Additionally, the Post Kit includes a cap to go on top of the post and an ACQ pad to fit under the mounting flange if mounting onto treated wood. This creates a buffer between the aluminum mounting flange and the treated wood to avoid possible chemical reactions. NOTE: The fasteners for mounting this post are not included. Includes Cap, Base Trim and ACQ Pad for use in treated wood. Designed for Post-to-Post Mount in which the Top Rail butts into the face of the post. For use with 42" Level Rail, at the top of 36" Stair Rails and at the bottom of 36" Stair Rails.